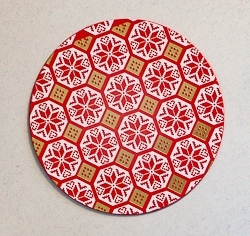 Beautiful designer paper coaster with dainty needlepoint flower motif. with gold foil accents. Protect your furniture while enjoying your favorite beverage. Approx. 4" diameter with cork backing. Protected against moisture - wipe dry. Not intended for submersion in water. Note: Only four available.